edit : on 2016-04-23, partial kit is discontinued, PCB is still offered. Case Assembling Guide : M3*11+6 hex copper standoffs between faceplate and pcb. Then M3*20 hex copper standoffs between the back of the PCB and the bottom of the case. Thank you Peter for this awesome sounding design! Moderators: I don't know if this post should be in S/T but I think this is only for the people in CL sub forum. If I need to post this info there please inform me I'll edit my post. it - and honor to both you and peterb, zilaihong! i personally have yet to acquire any CL instruments (still need to finish a few things elsewhere in my system, mainly wiard 300-related before i think i will be ready to walk this interesting path). but i've been really, really impressed with the sheer visual beauty and intelligently chosen layout of your acrylic *recombination* of the sid and the tet!! i think the sum of what you have produced there exceeds the individual terms, which themselves are already great in terms of musical interest to begin with. and i absolutely must have one of these, some day, as my primary personal perfomance organus! have you thought about designing an acrylic coco-baby at some point, btw?! That instrument is very lovely and it will be an one-off instrument (tetrazzi is discontinued). I am currently selling it for $1300 because I plan to buy more from peter! $1300 is really a bargain price. I don't find any circuit for coco stuff on ciat-lonbarde website, maybe peter doesn't want to disclose them or it is my bad web search skill? I'll check the pcb design, and tomorow the files will go to factory. After a few days I'll get the boards and build them. I design this basically because I want a compact and flexible CL drum box to make my CL album with, and these can also be patched into other CL instruments to form a super nabra modular. Realy interesting, a great idea. I will follow progress. I presume the intention would be to offer builds for sale? so it looks like there are 18 roolz "cells", that could be patched in different combinations of 3/4/5/6... like two 4s and two 5s, or three 6s... is that right? i was trying to work out something like that and my first attempt failed. at any rate, i'm interested as always. what about the gong/avdog? thanks for continuing this series! I'll have the price for the built ones later. No they are fixed 3/4/5/6 roolz. In theory it is possible to use re-configurable "cells". It will be an easy mod if you want that. Just cut several traces on pcb and solder some jump wires. No gong/avdog on this one, it is ultrasonic purist my friend! I'd be interested in this PCB. In fact, any of your PCBs. Are they listed for sale somewhere? Thank you for the interests. Please see the other thread for some info. It is snowing today in beijing. I got up early and couldn't sleep. Designing the pcb for gongz! ^ com'on spell it out for the circuit illiterate amongst us. So this is a full roolz-5!!!!! Use it to make solo analogue tracks / make backing tracks for singing or jamming along on the organus / expand your nabra modular. Compact and all self contained, with banana jacks / neutrik audio jacks on the pcb. Worked on this pcb for a whole day long, but I am excited! I hope everything turns out to be fine. Now I'll have a drink to celebrate. As always, honor to peter b! hope it keeps snowing in beijing thanks, MQ! Is there a Ciat Lonbarde for dummies? The plumbutter 'manual' explains a lot of these terms. This is what I am gonna do, great advice. Nice work, zilaihong! I like the look of your PCBs. Which program do you use to make them? My only suggestion would be to make all of the filter modules (AVDog, Gong, Ultrasound filter) outputs patchable, not hardwired to the outputs, because the ultrasound filters tend to make sound even when nothing is patched into their inputs. This also makes it possible to add mixers and process other Rollz modules with the ultrasound filters or cascade the filters, which can often produce great results. I would definitely pay $20 for a full Rollz-5 PCB especially if all the filter modules weren't hardwired to the outputs, though I guess cutting traces is an option. Maybe jumpers are a good idea? Also, the Rollz-5 write-up on Peter's site is good, but there's a slightly different version in the Leonardo Music Journal that explains some of the controls in more detail. I can't dig it up at the moment, but if you can find it I highly recommend reading it. In particular, the pots for the gongs are explained better there than on the CL site. richard, if you're up for a real challenge or just need more fodder for coffeetime please ponder the fyrall and fourses documents and explain how the hell they work! well i pretty much get the fourses but no clue with the fyrall.. Yes, many cups of coffee while perusing fourses and fryall. I went back to studying fryall just recently. The oscillator design is very interesting. In section Z six oscillators connect in a loop, such that each modifies the frequency of the next, each going through a VCA that controls the depth of the FM. (The same theme is found in Cocoquantus.) The tricky part is the CV for each of those six VCAs. C Section (COUNTEN) is driven by the VCOs and produces six staircase waves. Section O (the ORRANGER) takes in the six VCO outputs plus the six staircase waves and selects from these to go back to control the VCAs. Section P is just a couple more VCOs to produce outputs for touch nodes. But there's more. An external input can go into the Spesal Cuck. This would affect all the oscillators. There's also a speaker driver, but I can't figure out where the input for that comes from. I wonder how anyone could have assembled a Fryall from these instructions. Thank you! I've been using a small program called Sprint layout. It is an easy tool without fancy automatic features. But it is enough for me. 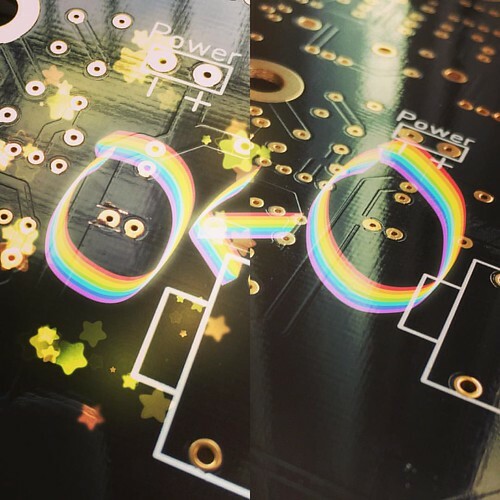 This pcb is a tribute to peter's original wall-hanging rollz-5 machine, and basically contains same modules (minus 2 six-roolz, his version has 4 six-roolz). And thanks to your request : you can find something like a small octagon pad with a rectangle pad on my pcb. 12 of them. Just cut the trace in the middle. The signal of this module is then cut off from the mix, and solder a wire on the octagon pad to get the signal. Then everything is completely modular. 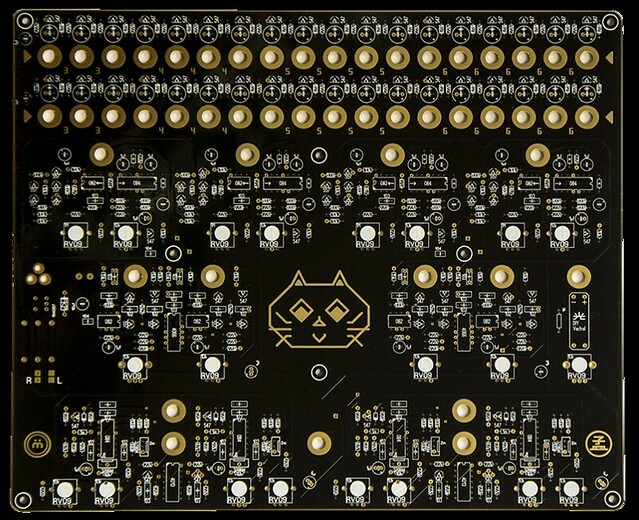 This pcb just went to factory today and I'd say it will be 30$ per piece due to the cost. Do you mean the article here? $30 is still reasonable considering your efforts and the amount of time saved by not having to build on the paper circuit boards. Provided they work alright, I'll definitely take one and might be up for two. Yep, that's the article. I'm pretty sure that the document on the CL Rollz-5 page is a draft for the article as it is very similar yet there are some additional notes. It's been a while since I've looked at either though.